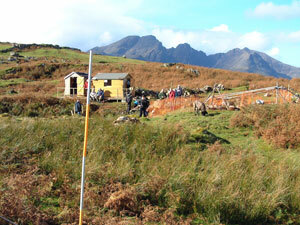 Despite some pretty appalling weather the High Pasture Cave Open Days were a great success. Read on for details of the weeks events and some important news regarding the Iron Age burial reported on during the last News release. The Open Days held at the High Pasture Cave site between the 5th and 12th October were a great success, despite a period of unsettled weather during the middle weekend with torrential rain and strong to gale-force winds. The visitor book for the site was signed by at least 320 people during the eight days of the event, people coming along from the Black Isle, Inverness, Nairn, Elgin, Fort William, Lochailort, Aberdeen, Edinburgh, Continental Europe and Skye & Lochalsh District. The Highland Council Rangers (John Phillips and Sarah Kay) provided guided walks around the archaeological landscape surrounding the High Pastures site, while two days were set aside for special activities such as face painting, Celtic jewellery making, pot making and the chance to have a go at a specially-designed crossword with questions relating to the discoveries at High Pastures and life in the Iron Age. The children visiting the site seemed to enjoy the activities, having a go at everything on offer including trying their hand at grinding barley using a saddle quern and rubbing stone. Unfortunately, the wet and windy weather during the weekend of the Open Days stopped us from going ahead with our pig roast, but we did experiment with cooking using hot-stones in a pit. 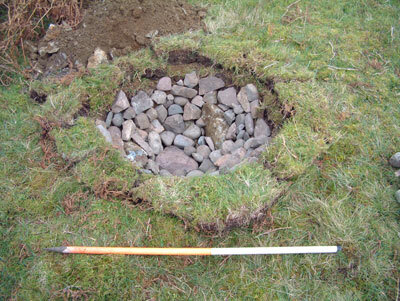 After digging a pit in the ground approximately 1 metres in diameter and around 0.7 metres deep, we lined this with rounded pebbles from the beach at Camas Malag - which is located around 1km to the south of the High Pastures site. 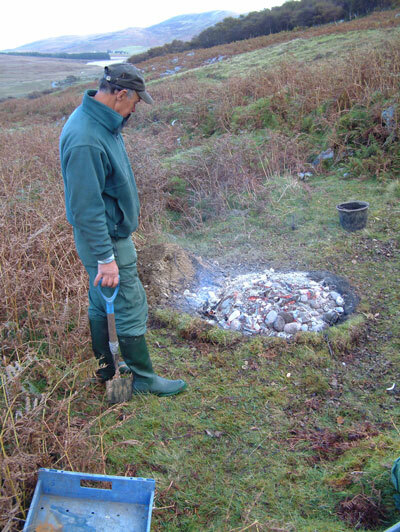 Using hazel and birch wood we started a fire in the open pit, which we kept fuelled for around 2 hours, adding additional stones during this time. As soon as we saw the stones were glowing hot in the fire we quickly removed them, along with the burning embers, from the pit and put them to one side. We quickly placed our prepared meat (venison) and vegetables, which we had already seasoned and wrapped in cabbage leaves, onto the bed of hot stones, placing the other stones removed from the fire between the parcels of food. 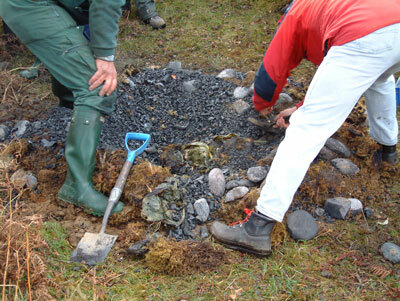 After covering the top of the pit with another layer of hot stones, we covered the pit and its contents with the soil removed when digging the pit. 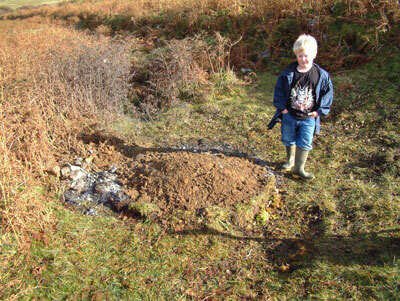 With the pit and its contents covered over, a young visitor to the site eagerly awaits dinner! After three hours steaming away in the underground pit, we thought the food would now be ready for eating. So, with people standing around to await the results, Martin and Steven carefully removed the soil covering to expose the hot stones and embers below. The smell of the food started to drift up from the pit and we uncovered the parcels of food. Unfortunately, some of the cabbage leaves in which the food had been wrapped had burnt away, leaving some of the food slightly over-cooked, but most of the contents of the pit was edible! In particular, the large chunks of venison were cooked well, the moist method of cooking (steaming) resulting in very tender meat. Note the Iron Age spade used in this experiment - a tool necessary to quickly and efficiently remove the hot stones and embers from the fire! 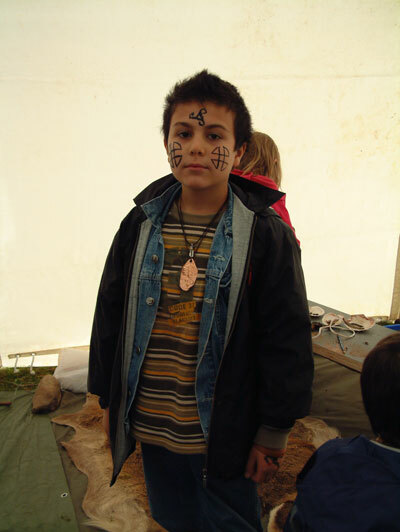 Visitors to the High Pastures site during the Open Days also had the opportunity to have a go at wet-sieving sediments from Bone Passage, which were found to contain Iron Age artefacts including pottery, iron pins and nails, animal bone and charcoal. There was also on-site display panels located in one of the site huts showing some of the work that has been carried out on site during 2004 and 2005, accompanied by digital video of the excavations and other fieldwork at High Pastures. We also had the opportunity to try out the new CCTV cameras and lighting located in Bone Passage, with live feeds visible on the colour monitor in the site hut on the surface. Installed by Ivan Young and Pete Ireson of the Grampian Speleological Group, based in Edinburgh, the equipment allowed the visiting public to see work progressing underground. Our thanks go out to Ivan and Pete for their timely installation, and to Highland Council and Skye & Lochalsh Leader+ for funding the installation. 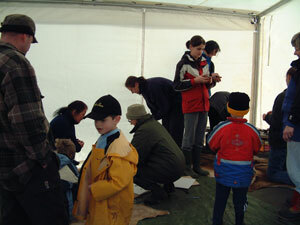 Overall, the Open Days were well received and we hope to build on their success during 2006 and 2007. 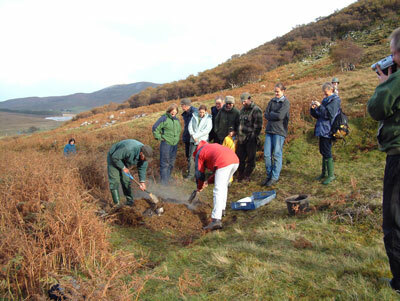 In conjunction with the Open Days, public lectures of the archaeological work undertaken at High Pastures were presented in Portree, Kirkton and Inverness during the Highland Archaeology Fortnight. 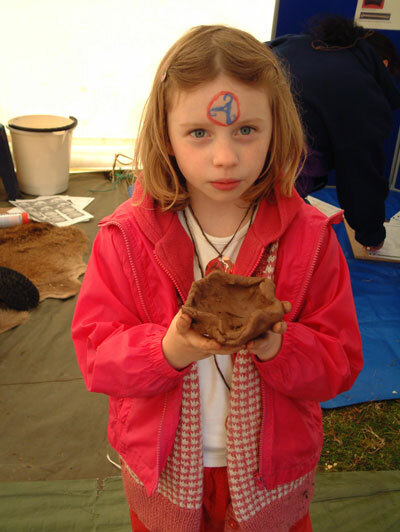 With a view to the future, we hope to stage a wide range of events centred on the High Pasture Cave site during the Highland 2007 Year of Culture. 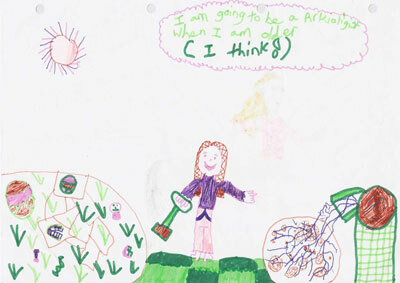 Finally, may we send a big thank you from the Project Team to Daisy (aged 7) from Kensaleyre, Isle of Skye, who sent us a copy of this picture she had put together after her family visited the site during the Open Days. The image vividly portrays her views of the site and what we had recently uncovered. We would also like to thank all of the people who helped the project team with the Open Days including Hector & David Nicolson, Ann & Mike Kibby, John & Rosaidh Phillips, Sarah Kay, and of course the visiting public, without whom the event would not have been such a great success. Due to the numbers of visitors to the site during the last couple of weeks there has been little excavation on site. However, we have received some important news from Laura Sinfield in Edinburgh, who has been carrying out the anatomical study of the Iron Age human remains that were found in the top of the man-made entrance passage. 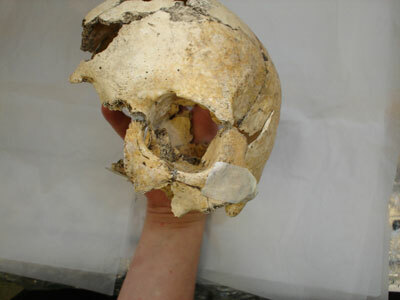 The remains were confirmed as that of a woman aged between 32 and 35 years, of around 5’ 2” in height. The individual had suffered from at least two bouts of serious illness during childhood and when she died had a large open tooth infection in her lower jaw, a possible cause of death in an age with no known antbiotics. 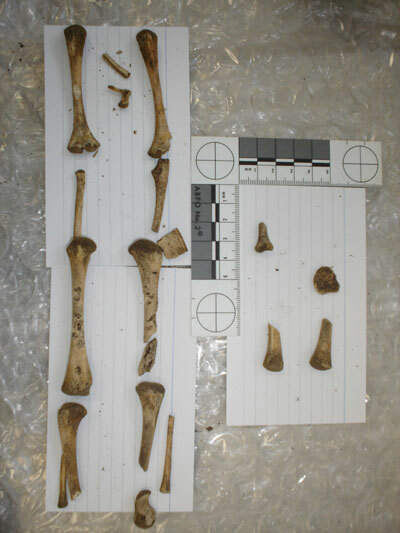 The image above shows the recovered elements of the skeleton relating to the upper body. 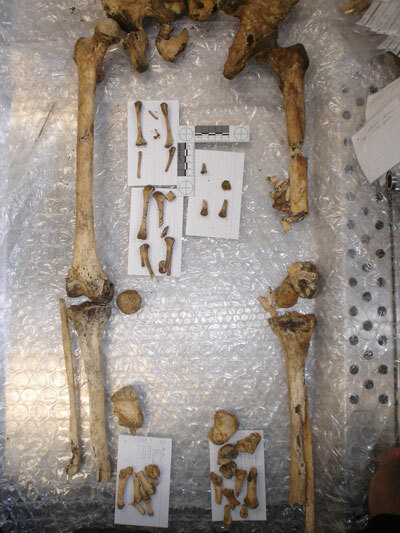 Bones relating to the hands are set out on the white cards, while the damage caused to the right side of the rib cage by large rocks found on this area of the body is evident. 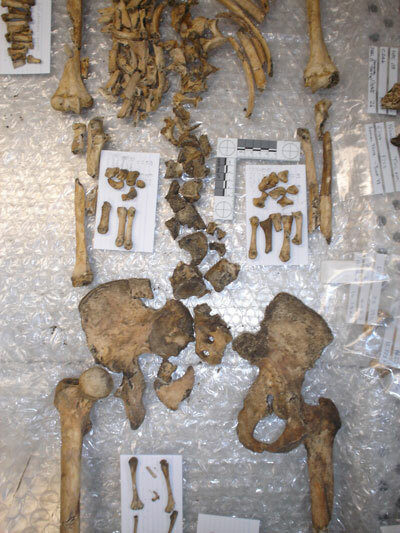 The image above shows the central region of the skeletal elements recovered from the burial including the pelvis and femur, while the image below shows the lower extremities of the body. Bones from the feet are located on the white cards towards the bottom of the image. Laura is now going over the skeletal material in more detail to investigate possible causes of death and other trauma in the bone of the woman. Of particular note is the fact that little post-depositional attrition was found on the bone related to scavenging by animals, with only a few signs of gnawing by smaller rodents such as voles and rats (we found bones relating to the remains of rats and voles in the fill of the grave). This suggests that the woman was either buried quickly, or was in some way covered and protected from scavengers. It is possible that the remains of collapsed corbelling identified above the entrance passage, in which the woman was placed, was still standing at this time forming an enclosure over the burial. However, it was the next series of updates from Laura on the skeletal material recovered from the burial that came as a complete shock to the project team. She confirmed that the woman was carrying a foetus between 4 and 6 months of age, which was represented by a few tiny fragments of bone (see image below - bones on card to right). There was more to come. 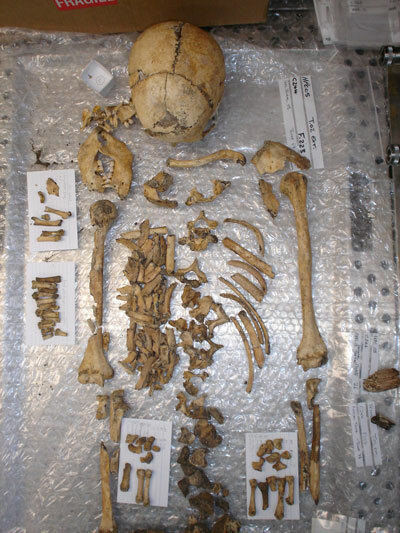 Laura also identified the remains of an infant of 9 to 12 months in age, which had been placed in the grave between the womans legs (bone on card in the left of the image below). This news resulted in a myriad of questions including what was the relationship between the three individuals in the grave; how had they died; was the cause of death some form of disease or accident, or was there a more sinister side to the story? Laura will be looking at the remains in more detail to see if she can shed more light on these questions. 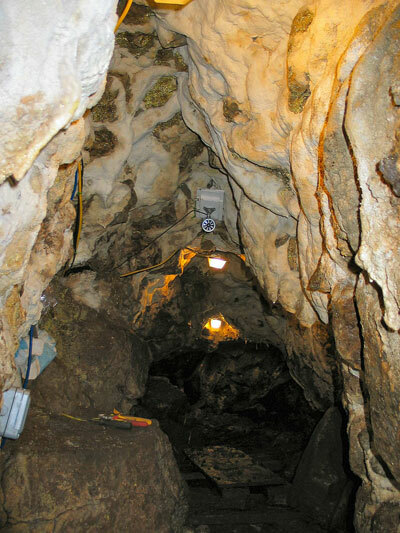 Whatever the case may be, the discovery of the human remains placed in the top of the man-made entrance to the cave below has opened a whole new line of enquiries. This portal into the Iron Age Underworld, or Otherworld, was obviously important to the people who visited the site and made their votive offerings there. When the cave passage and the stairwell to the surface was eventually blocked and sealed by the iron Age communities living in the area surrounding the site, the placing of the woman and the infant in this liminal place in the landscape was a deliberate form of closure of this monument. Who was the woman and what was her status in society? Work on site next year will hopefully shed new information with relation to the use of the cave and the surrounding landscape. The excavation of the remaining deposits in the stairwell leading underground will be particularly exciting, with the likelihood of more inhumations to be uncovered in this ‘special place’. The badly damaged cranial elements of the woman reconstructed by Laura at the University of Edinburgh Medical School, with the side profile (above) and a frontal view of the skull (below). 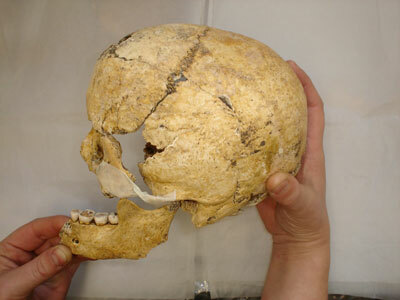 The lower image shows the extreme damage caused to the cranial elements of the human remains caused by the large, pointed rock, found in-situ during the excavation of the burial. Was this merely a accident caused by the collapse of the corbelled roof onto the skeleton in the grave, or could it have been a deliberate act carried out some time after the woman had been placed in the grave setting? We visited the site and were most impressed by the amount of work and dedication of the team. The story that is unravelling is most intriguing. We had such an interesting time that we all decided we would love to come back next year and help. Will be in touch. Frances and Murdo Ross, and Helen Stewart. Alf, nice to hear from a friend, keep visiting the site as we will occasionally update the news section as results come in from the specialists. Next year should be an interesting one (excavation restarts in March) as we excavate deeper into the stairwell and explore the round house to the south of the site. speaking to your mum today. she tells me the project is closing for the season. i shall miss my weekly fix from high pasture. may i say say what a wonderful site it is. ihave contact with other archeological site but yours wins hands down. your team are so profesional all deserve congratulations. please keep me in touch with any future developments. Surely the web site will stay open for any developments from investigations.